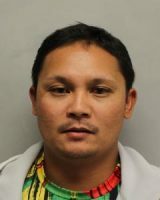 Hawaiʻi Island police charged two people in connection with a robbery stemming from a road rage incident on Kīlauea Avenue in Hilo. At 8:49 a.m., Monday morning, (November 13), police responded to the courthouse parking lot in Hilo for an incident involving two motorists. The victim, a 53-year-old Keaʻau man, told police that a Nissan sedan followed him into the parking lot where the female driver of the sedan approached him. During an argument with the woman, a male passenger got involved and assaulted the victim. During the assault, the female suspect went into the cab of the victim’s truck and stole his backpack. Both suspects shoved the victim when he tried to retrieve his backpack then both suspects fled the area in their vehicle. The victim sustained minor injuries and declined medical treatment. Yesterday, (November 14), 25-year-old Chantel Takabayashi, and 31-year-old Rendell Naiga, both of Pāhoa, were arrested in Hilo after turning themselves in to police. Detectives from the Area I Criminal Investigation Section continued the investigation and charged both suspects with second-degree robbery and unauthorized entry into a motor vehicle. Their bail was set at $7000 each. The suspects were released from police custody after posting bail and are expected in District Court on (December 19). Anyone who may have witnessed the incident or have any other information about it is asked to call the Police Department’s non-emergency line at (808) 935-3311 or Detective Jesse Kerr of the Area I Criminal Investigation Section at (808) 961-2382 or Jesse.Kerr@hawaiicounty.gov.